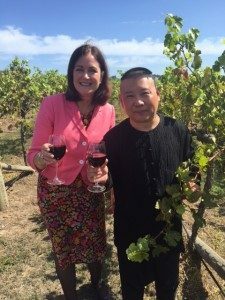 A Chinese comedian has made the largest private label wine exporting deal in Australian history agreeing to export 800, 000 bottles of Victorian shiraz into his home country. Comedian Guo Degang is popular celebrity in China and is amongst the country’s top 100 richest celebrities. Degang’s influence will now expand outside comedy after striking a deal with Mt Duneed Estate in Geelong, Victoria. The deal will start with the export of 800, 0000 bottles but should expand to a AUD$100 million – AUD$200 million deal within six months if everything goes according to plan. The deal is the first major wine export arrangement made after the new China Australia Free Trade Agreement (ChAFT) came into effect on 20 December 2015. Under ChAFT tariffs on wine exported to China has dropped to 8.4 per cent. The tariff will be reduced to zero within the next four years. Prior to ChAFT it was 14 per cent. Sarah Henderson, the Liberal MP for Corangamite in the Geelong region, said she believes the deal should help bring Chinese tourists to the region. “With Mt Duneed Estate sourcing the wine from across our region, this will deliver a major economic boost to our wine industry,” she said. According to Wine Australia, an Australian Government statutory service body for the Australian grape and wine community, China has been Australia’s fastest growing export market for several years now. Exports of Australian wine to China in the 2015 calendar year surged by 71 per cent with 68 million litres brought into the country. The wine’s value increased by 66 per cent to AUD$370 million. The growth makes China the third largest market for Australian wine producers. The US is currently Australia’s biggest market, the UK is second. “Australia’s market share in China also remains strong, accounting for 23 per cent of the value and 14 per cent of the volume of total bottled imports as of year ending October 2015, ranking second behind France,” Wine Australia says. “Australia’s average value of bottled imports (US$7.66 per litre) is the highest among the top five importing countries,” Wine Australia reports. Austrade reports that China’s middle class are the main market for higher-value Australian wines. The trade body says china’s middle-class will have long-term, stable purchasing power and brand awareness now and in the future.